Another week, another Ninja stripdown update! With the ECU, battery and alarm all housed in the sub-frame there was a lot of wiring loom in the way of getting the sub-frame off the bike. Aside from a retaining bracket not a great deal can or needs to be disconnected; once the lights are unplugged (and labelled up) the loom just needs feeding through the frame towards the front, 4 bolts and the subframe is away! 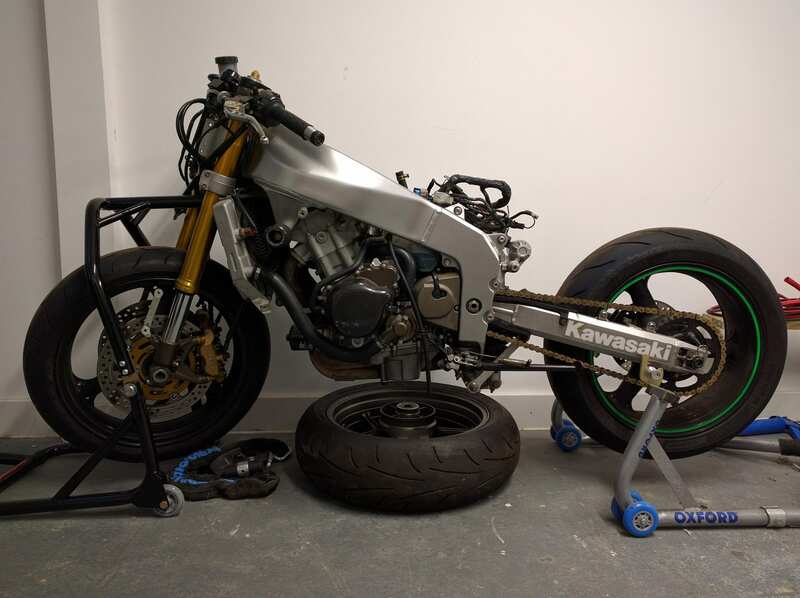 Looking a bit less like a motorbike, but still a long way left to go yet. That wiring loom just sitting on the cross brace seemed like a job half done so I thought I’d try and get that completely disconnected next. Disconnecting the loom is pretty simple but carefully labelling everything as you go takes time. You also have to make sure things like the injectors and spark plugs are all labelled in the correct order, it’s a lot less fun than taking stuff apart with spanners. The main loom is connected to several ancillary looms which come off separately. I found myself with one connector to an engine sensor that I couldn’t quite reach to disconnect. It’s behind the radiator on the right and with the bike against the wall access isn’t great. This has left me with a completely disconnected loom, aside from this one sensor. To get the radiator off I need to drain the coolant system and to do that I need something to drain the coolant into. Yea, a bucket would probably be fine but then you’re left with the problem of how to responsibly dispose of it. An open bucket in the back of the car to the recycling centre isn’t going to end well. I’ll order something designed for the job and finish getting the loom out later in the week.